Częstochowa (German: Tschenstochau, Yiddish: טשענסטעכאוו-Chenstekhov) is a city in south-central Poland on the Warta River. It was formed from two settlements: Old Częstochowa, founded in the thirteenth century; and Jasna Góra, founded in the fourteenth century. The two were merged in 1826. The town is known for the famous Paulist monastery of Jasna Góra that is the home of the Black Madonna painting, a shrine of the Virgin Mary, as well as valuable frescoes. 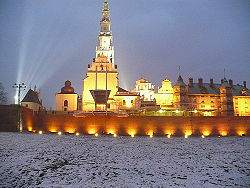 The fortified monastery was a stronghold for Polish forces during the Swedish invasions of 1655 and 1705. There is also a Lusatian culture excavation site and museum in the city and ruins of a medieval castle in Olsztyn, approximately 15 kilometers (9.3 mi) from the city center. These sites attract millions of pilgrims annually. Today the city has approximately 250,000 inhabitants and is an important industrial city with glass and paper manufacturing, textile mills, chemical and food processing centers, as well as an iron and steel plant. From 1975 to 1998 it served as the capital of Częstochowa Voivodeship. The name Częstochowa means "Częstoch's place" and comes from the personal name Częstoch, mentioned in the medieval documents also as Częstobor and Częstomir. The original name was mentioned (spelled as Czanstochowa) in 1220, (or spelled as Częstochow) in 1382 and 1558. The village of Częstochówka (Jasna Góra) was a separate municipality mentioned in the fourteenth century as the Old Częstochowa (Antiquo Czanstochowa, 1382) and Częstochówka in 1470-1480. The city was also known in German as Tschenstochau and in Russian as Ченстохов (Chenstokhov). The village of Częstochowa was founded in eleventh century. It is first mentioned as a village in historical documents from 1220. In 1382 the Paulist monastery of Jasna Góra was founded by Władysław Opolczyk (Ladislav of Opole) - the Polish Piast prince of Upper Silesia. Two years later the monastery received its famous Black Madonna icon of the Virgin Mary and in subsequent years became a center of pilgrimage, contributing to the growth of the adjacent town. Before 1377 Częstochowa received a town charter, which was later changed to the Magdeburg Law in 1502. In the seventeenth century the local monastery was converted into a fortress, which was one of the pockets of Polish resistance against the Swedish armies during The Deluge in 1655. The Jewish community in Częstochowa came into existence by about 1700. After the second Partition of Poland it was annexed by Prussia. The monastery of Częstochowa, beginning in February 1760, was the site of the 13-year imprisonment of Jacob Frank, the Jewish religious leader and founder of Frankism. He had been tried by church tribunal in Warsaw and convicted as a teacher of heresy. Frank's imprisonment lasted 13 years, yet it only increased his influence with his group, many of who established near him in Częstochowa. After the first partition of Poland, Frank was released by the Russian general Bibikov, who had occupied Częstochowa, in August 1772. During the Napoleonic Wars, in 1807 Częstochowa became part of the Duchy of Warsaw and since 1815 the Kingdom of Poland. This began a period of fast growth for the city. In 1819 renowned military architect Jan Bernhard planned and started the construction of Aleja Najświętszej Panny Marii - the (Holiest Virgin Mary Avenue), which currently is the main artery of the modern city. 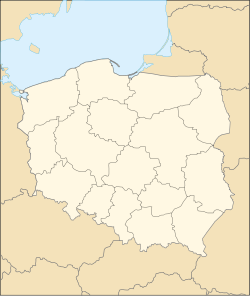 The two existing towns of Częstochowa and Częstochówka (the latter received the city rights in 1717 as Nowa Częstochowa) were finally merged in 1826. In 1846 the Warsaw-Vienna Railway line was opened, linking the city with the rest of Europe. After 1870 iron ore started to be developed in the area, which gave a boost to the local industry. Among the most notable investments of the epoch was the Huta Częstochowa steel mill built by Bernard Hantke, as well as several weaveries and paper factories. During World War I the town came under German occupation, and in 1918 it became a part of the newly-reborn Republic of Poland. The new state acquired large deposits of good iron ore in Silesia and the mines in Częstochowa became inefficient and soon were closed. This brought the period of prosperity to an end. At the same time a bishopric was relocated to the city in 1925. After the Polish Defensive War of 1939, the town was occupied by Nazi Germany, renamed to Tschenstochau, and incorporated into the General Government. The Nazis marched into Częstochowa on Sunday, September 3, 1939, two days after they invaded Poland. The next day, which became known as Bloody Monday, approximately 150 Jews were shot and killed by the Germans. On April 9, 1941, a ghetto for Jews was created. During World War II approximately 45,000 of Częstochowa's Jews were murdered by the Germans, almost the entire Jewish community living there. The city was liberated from the Germans by the Red Army on January 16, 1945. Due to the communist idea of rapid industrialization, the inefficient steel mill was significantly expanded and named after Bolesław Bierut. This, combined with the growing tourist movement, led to yet another period of fast city growth, concluded in 1975 with the creation of a separate Częstochowa Voivodeship. Today Częstochowa is one of the main tourist cities in the region and is sometimes called 'little Nuremberg' because of its number of souvenir shops and historical monuments. It attracts millions (4.5 million in 2005) of tourists and pilgrims every year. 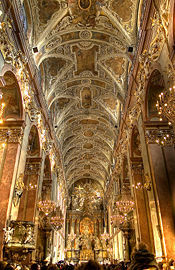 The Jasna Góra Monastery was founded in 1382 by Pauline monks who came from Hungary at the invitation of Władysław, Duke of Opole. The monastery has been a pilgrimage destination for hundreds of years, in large part because it contains one of the most important icons of the Virgin Mary in this part of Europe, The Black Madonna of Częstochowa. 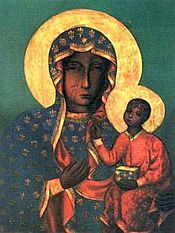 The Black Madonna of Częstochowa is a holy icon of the Virgin Mary, that is both Poland's holiest relic and one of the country's national symbols. The origins of the icon and the date of its composition are still hotly contested among scholars. The difficulty in dating the icon stems from the fact that the original image was painted over after being badly damaged by Hussite raiders in 1430. Medieval restoration methods removed much of the original paints. Although the icon of Our Lady of Częstochowa has been intimately tied with Poland for the past six hundred years, its history prior to its arrival is shrouded in numerous legends which trace the icon's origin back to St. Luke who, it is believed, painted it on a cypress table top from the house of the Holy Family. One of the oldest documents from Jasna Góra states that the picture traveled from Jerusalem, via Constantinople and Belz, to finally reach Częstochowa in August 1382 by Władysław Opolczyk, Duke of Opole. The Black Madonna is credited with miraculously saving the monastery of Jasna Góra from a seventeenth century Swedish invasion, The Deluge, which actually changed the course of the war. This event led King Jan Kazimierz to "crown" Our Lady of Częstochowa ("the Black Madonna") as Queen and Protector of Poland in the cathedral of Lwów on April 1, 1656. Another legend concerning the Black Madonna is that the presence of the holy painting saved its church from being destroyed in a fire, but not before the flames darkened the fleshtone pigments. The legend concerning the two scars on the Black Madonna's right cheek is that the Hussites stormed the Pauline monastery in 1430, plundering the sanctuary. Among the items stolen was the icon. After putting it in their wagon, the Hussites tried to get away but their horses refused to move. They threw the portrait down to the ground and one of the plunderers drew his sword upon the image and inflicted two deep strikes. When the robber tried to inflict a third strike, he fell to the ground and squirmed in agony until his death. Despite past attempts to repair these scars, they had always reappeared. Another legend states that, as the robber struck the painting twice, the face of the Virgin Mary started to bleed; in a panic, the scared Hussites retreated and left the painting. The painting, depicting Mary, the mother of Jesus, displays a traditional composition well-known in the icons of Eastern Orthodoxy. Madonna is shown as the "Hodegetria" ("One Who Shows the Way"). In it the Virgin directs attention away from herself, gesturing with her right hand toward Jesus as the source of salvation. In turn, the child extends his right hand toward the viewer in blessing while holding a book of Gospels in his left hand. The icon shows the Madonna in fleur de lys robes. The Black Madonna of Częstochowa. Czestochowa Radomosko Area Research Group. Town Histories Retrieved September 12, 2008. St. Mary of Czestochowa Church (Middletown, Conn.). 2004. Saint Mary of Czestochowa parish Middletown, Connecticut : 100th anniversary, 1903-2003. [S.l. ]: Olan Mills Church Directories. We Remember! Shalom! We Remember Jewish Czestochowa! Retrieved September 12, 2008. This page was last modified on 20 November 2017, at 22:26.